Our little one is growing up so fast! First an olive, now a fig. Yeesh, before we know it we'll be sending them off to college. These past couple of weeks seem to have passed by rather quickly. I'm hoping it keeps up at this pace. Since our last post, this baby mama has been extremely tired, more so now than in the beginning. Also, instead of pasta and cheese cravings, now it's nothing but bread. Hoping that when the placenta (I think this is such an odd word) finally takes over, which should be very soon, I can gain my energy back and hopefully control my eating habits. A good friend of mine, and co-worker, was looking to sell her gently used elliptical. I knew of no one better than myself to take it off her hands. It was delivered this morning and I plan on putting it to great use. For now it sits in the middle of our garage, until Rich decides to clear out a space for my "workout section" (hehee). With the weather starting to cool off a little, I shouldn't pass out from a heat stroke. Let's hope. An even greater family friend, Melissa, who just gave birth to a beautiful baby girl a month ago, recommended a ultrasound facility to us. This facility is a little ways from home, but is well known around town for their 3d and 4d ultrasounds. Also, they're the only facility who is able to determine the gender of your baby as early as 15 weeks. Usually, physician offices do not tell you the gender until about 20 weeks. With that being said, we will be utilizing their services as soon as we possibly can. We bought a package for the gender u/s at 15 weeks, and then return between weeks 26 and 33 for our 3d/4d ultrasound, which also includes a video recorded DVD and a CD-ROM containing the still photos from our session. Our first session will be Thursday, October 28th. I can't think of a better Halloween surprise! Most people would kill to have a belly that looks that good! I know this is only temporary so I'm willing to sacrifice. I've given up worrying about the weight and belly. It's still such a shock at times to look at these pics and see how I've grown. It's an amazing thing! I got you a present today-I will mail it as soon as I get to the PO. Hint-it's something to wear!Got it on clearance at Target today. 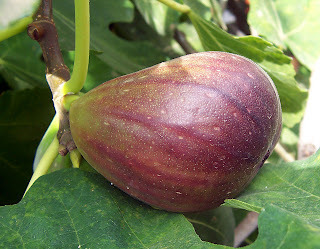 Now a fig--that's cute. 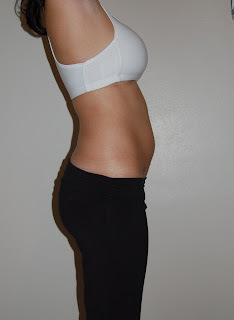 Make sure you measure your waist every now and again--I think you'll be amazed as time goes on how far it can stretch! Mine was once 44". I love your little baby ;) I love it!! So excited!!! !